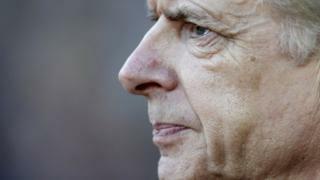 Arsenal manager Arsene Wenger praises his side for their "committed performance" as they beat West Ham 2-1 at Upton Park. Santi Cazorla put the visitors ahead from the penalty spot before Danny Welbeck made it 2-0 and although Cheikhou Kouyate's header gave the hosts hope, Arsenal dug in to claim all three points. The win moves Arsenal up to fifth place in the Premier League table, leapfrogging their London rivals in the process.